DJs, drinks, and discounts, oh my! As if you needed another reason to count the minutes till happy hour, Oliver Peoples' Summer Sessions shopping event is back! Thursday (as in tomorrow!) from 6 to 9 p.m., there will be DJ sets, free drinks, and a huge selection of top-brand summer sunnies marked down to sample-sale prices — we're talking all under $120! Count on sipping Sunset Breezes and shopping priced-to-sell shades from labels like Oliver Peoples, Mosley Tribes, and Paul Smith. Oliver Peoples: making happy hour even happier since 1987. 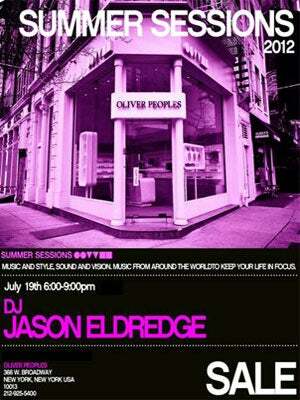 When: Thursday, July 19th, from 6 to 9 p.m.
Where: 366 West Broadway (at Broome Street); 212-925-5400.